In a recent survey, three-quarters of Americans said that they wanted to eat more sustainably. However, the average American diet remains resource-intensive. The U.S. ranks near the top of the global list in meat consumption per person, and as a result, our research shows that the average U.S. diet is nearly twice as land- and greenhouse-gas-intensive as the average world diet. In a world that expects to welcome another 3 billion people to the middle class in the coming decades, eating more sustainably can help ensure global food security without undue pressure on forests, water and the climate. Eat fewer animal-based foods—especially beef and lamb—and more nutritious plant-based foods. 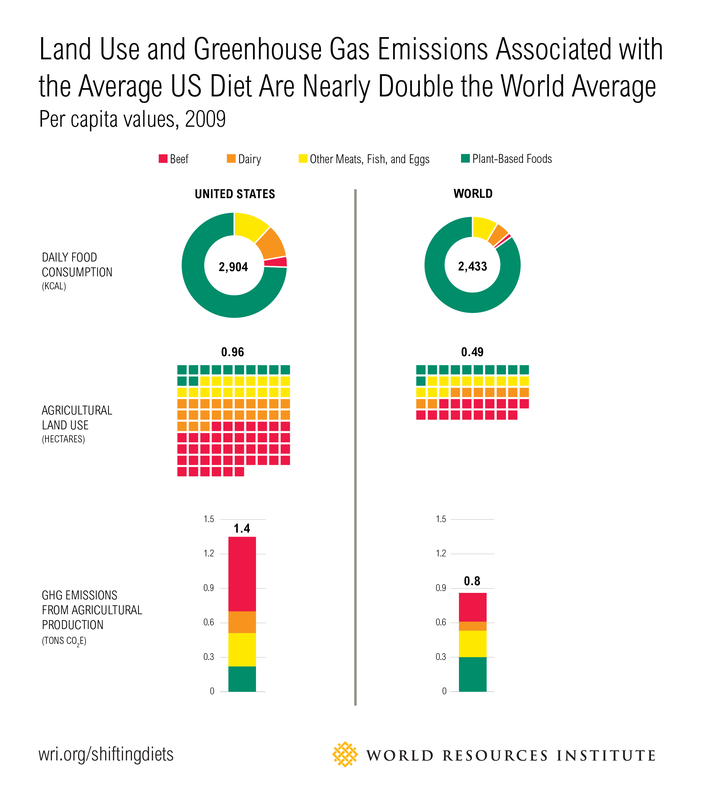 Beef production accounts for nearly half of the greenhouse gas emissions associated with the average American diet, and animal-based foods as a whole (all meats, dairy, fish and eggs) account for 83 percent. The other 17 percent of the emissions come from production of all the plant-based foods—which include the vegetables, fruits, legumes, whole grains, nuts and seeds that nutritionists say we need more of. When looking at land use, the proportions are even starker—88 percent of the land used to grow food for the U.S. diet is for animal-based foods, with only 12 percent for plant-based foods. Importantly, you don’t need to go fully vegetarian or vegan to make a difference; even small tweaks to cut back on high-impact foods like beef and eat more nutritious plant-based foods like legumes or vegetables can greatly lower your diet’s footprint without radically altering your lifestyle. Using a tool like the Protein Scorecard can help you choose lower-impact foods that may also be cheaper and better for your health. 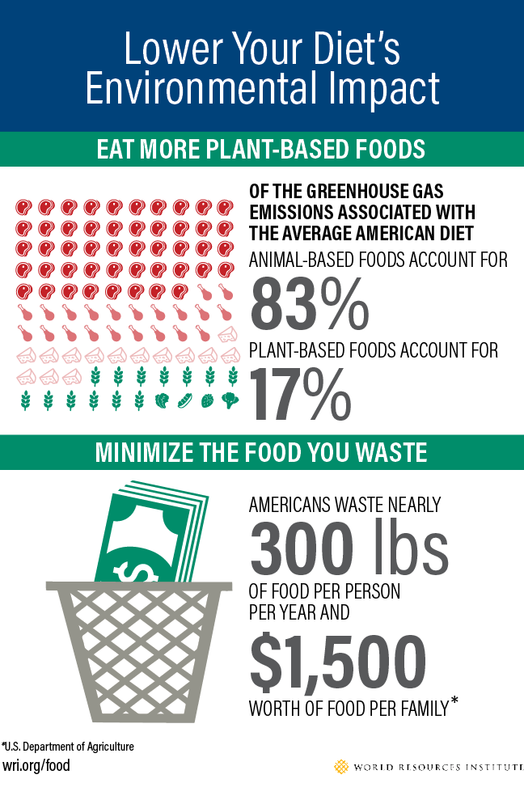 Minimize the food you waste. Globally, about a third of all food is lost or wasted between the farm and the fork. Here in the U.S., the figure is even higher: up to 40 percent of the national food supply is wasted each year. The average U.S. family spends about $1,500 on food per year that ends up in the trash. And if global food loss and waste were a country, it would be the third-largest greenhouse gas emitter. Making good use of food already grown and purchased is a major step toward a more sustainable diet. Fortunately, wasting less food isn’t rocket science. Simple strategies can make a big difference, like following a shopping list so you don’t overbuy, making the most of leftovers, improving portion sizes, and freezing more. Governments and businesses are also helping consumers reduce waste through steps like simplifying confusing date labels and providing new online resources. Author and activist Michael Pollan summarizes his philosophy for a better diet in seven words: “Eat food (meaning whole foods with simple ingredients), not too much, mostly plants.” We would slightly amend this to “eat food, not too much, mostly plants, and waste not.” As you buy, cook, and enjoy the meals you like, following these simple rules will put you on the front lines in the transition to a sustainable food future.